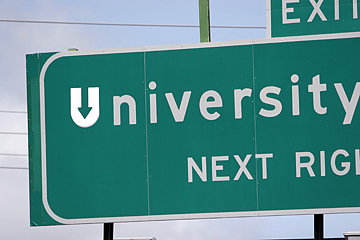 A UDown sticker was seen yesterday on the University exit over the Koko Head-bound lanes of the H-1 freeway. State transportation officials want photos of U-shaped stickers slapped on a number of freeway and road signs removed from a clothing and accessories Web site. Officials threatened UDown Shop owners in Kailua with a criminal investigation, alleging that it promotes vandalism and encourages the public to put stickers in far-removed places and endangers safety. "What we're more concerned about is those climbing over 30-foot signs and getting hurt," said Scott Ishikawa, Department of Transportation spokesman. On the Web site's gallery, a note states, "Submit to us a picture of you next to the (symbol). ... By doing so, you give UDown the rights of ownership to the image(s)." Photos from UDown's Web site, www.udownafied.com, show images of the popular logo sticker on freeway signs such as the University Avenue sign on the Koko Head-bound lanes of the H-1 freeway. Two months ago, the DOT sent a letter to UDown's four business partners -- Justin McCoy, Kanoa Somera, David Lau and Micah Kaaihili -- whose shop sells T-shirts, baseball caps, stickers and other items with their logos on them. Their most popular logo is the letter U with an arrow pointing down in the center. In the letter, the Department of Transportation requested the removal of certain photos from their Web site, including a silhouette of a person standing next to a freeway sign and a female holding another female on her shoulders while she stuck the logo sticker on a one-way sign. 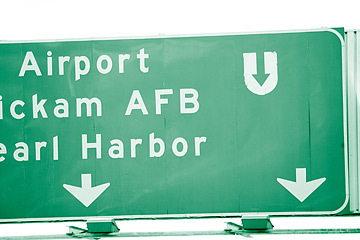 Another UDown sticker was noticed on a sign over Nimitz Highway at the Sand Island Road junction. "Your Web site encourages individuals to vandalize state property by means of putting your 'UDown' stickers on state highway signs and encourages individuals to submit pictures of those vandalized to you," said Deputy Transportation Director Brennon Morioka in the letter. "Those who aid, abet, solicit, or counsel individuals to vandalize state property, may be, at the very least, liable for civil damages for the cost of removal," Morioka said. He warned UDown that the matter would be referred to the attorney general's office for "criminal investigation and prosecution" if they do not remove the photos from the Web site. McCoy said he recently spoke to Morioka and told him that they will remove certain photos that have raised concerns. "We're just waiting for that," Ishikawa said. McCoy said they are in the process of removing the photos and adding text to their Web site stating that they will no longer accept photos. "We're revamping the whole site," he said. "It is being worked on." As of last night the photos were still on their site. They also plan to add a disclaimer to their Web site stating that the public should not risk their lives advertising their logo. "We don't want people to climb things. I don't want anybody to get hurt or, worse, killed," McCoy said. "We want people to know not to do that." The business name, UDown, comes from "You down," a phrase they used to question and challenge each other when attempting skateboarding stunts. All four have known each other since high school. It costs the state thousands of dollars to remove the stickers, and often it must temporarily shut down lanes to remove them from signs, Ishikawa said. "Going up there in an unsafe manner, it's a miracle nobody got hurt or killed yet. Not only do they put themselves in danger, they put those driving underneath in danger," Ishikawa said.